I had heard about Correlation Studios a couple of times before, but it was a recent mention by Jacquie that inspired me to reach out and request a tour. I sent Jami Garay an email and got a lovely reply back within hours about several things they are doing in the coming weeks and an open invitation to drop by anytime. Based on what I had been told, they were located above Northstar Pet Centre, but as I wandered the halls yesterday I couldn't find any sign of them. It wasn't until I bumped into Jami and her friend Gen in the parking lot that they guided me around the side of the building to a different entrance that led up to their 2,000 square foot digs. Jami has done a brilliant job of carving out areas in what appeared to be a wide open space. As I came in the door I was met by a nice sized gallery space with good light, laminate floor and a number of striking pieces on the walls. Beyond the opening on the other end of the room the floor changes to paint-splattered plywood sheeting. As my eyes swept from left to right, taking in numerous studio spaces defined by L-shaped walls that go up just high enough to create a sense of privacy but not too high to inhibit air flow, and an open area with a large work table, my pulse started to race. "I'm absolutely blown away," I said, truly stunned by the innovative use of space and the energy it creates. Jami works at The Keg to help fund this passion and this space. 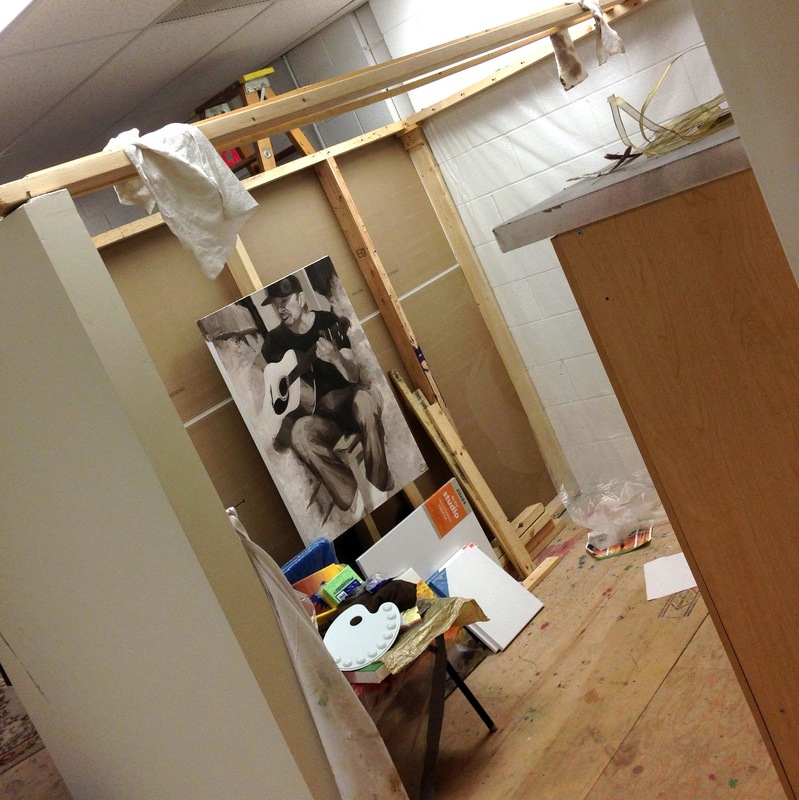 A number of artists had been renting studio spaces but several have departed to return to university for the fall. If there is a fit - she has a screening process - creative folks can rent studio space at a reasonable price (ranging from $250 - $350 per month) and emerge from the corner of the bedroom or basement. Leaning over their work table in the middle of the common space surrounded by studio cubicles, I talked to Jami and Gen about the work of Arts Council Wood Buffalo, the desire of the City Centre Centre team to begin to nurture a creative economy, and the opportunities for artists going into the future. Over and above wanted to get the word out about Correlation Studios, both its gallery space and studio spaces for rent, they also shared a number of different things coming up. On September 12th, they are hosting a Wood Buffalo Culture Network meeting, chaired by Gen Lacombe. On September 28th, Correlation Studios will host an open house, giving the general public the opportunity to come in and see their spaces and the artists at work. Gamay is working on a number of different projects including an exhibit of her own hand-crafted bone and feather hair pieces. "It will be my first legitimate exhibit," she wrote. "I also plan to host a live photo-shoot based on all four seasons that will display a series of hoods and head dresses that I'll be making specifically for the event. If all goes well, they will be auctioned off throughout the event." Jami is also working with my good friend Michael Moore (Flett, Manning and Moore) to resurrect an idea that we tried at interPLAY a number of years ago where photographers, poets and visual artists collaborate to create a series of creations that connect. If you're interested in getting involved email fmmartshow@gmail.com. 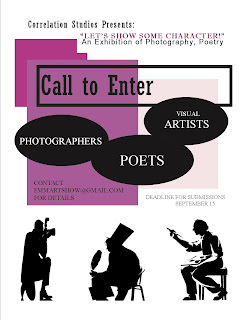 The deadline for submissions is September 15th. Global nomad and author of many best-selling leadership and personal development books, Robin Sharma shared on Twitter this morning that he plans to write a book on productivity one day. "It'll be just one page," he wrote. "And it'll have just one sentence: No More Excuses. Get it done now." Jame Gamay has taken the proverbial bull by the horns and is getting it done. She has carved out and committed to an innovative, creative space and is reaching out to other artists and inviting them to benefit from this space and the vibe it seems to generate. Seeing her energy, determination and positive attitude makes me incredibly optimistic about the future of our creative community and the work that will be produced right here in Fort McMurray. You can find Correlation Studios at 10216 Centennial Drive or by calling 587-645-1009. You can also LIKE their Facebook page by clicking here.